Several new accessions to the David Gascoyne Collection (GEN MSS 529) are now processed and available for use. The new accessions, acquired by gift and purchase from various sources, comprise a substantial literary archive documenting Gascoyne’s writings and longstanding relationship with Enitharmon Press. 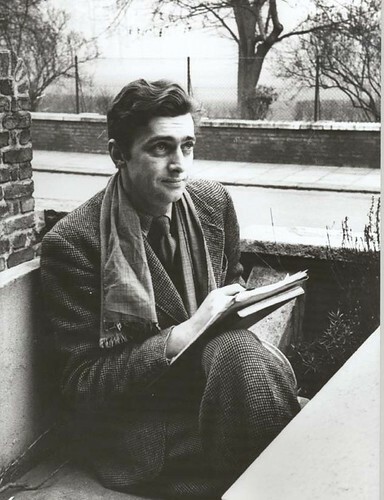 The poet and translator David Emery Gascoyne was born October 10, 1916 in Harrow, England and died November 25, 2001. His early career was characterized by a precocious energy that produced two volumes of poetry (Roman Balcony and Other Poems, 1932 and Man’s Life is This Meat, 1936), a novel (Opening Day, 1933) and a critical survey (A Short Survey of Surrealism, 1935) by the time he was twenty. He became one of the leading representatives of British Surrealism and was an important liaison between French and British circles. His diaries from the late 1930s are particularly well known and provide an excellent picture of the Parisian avant-garde on the brink of the Second World War. Gascoyne published several volumes of poetry in his early productive stage, but after 1956 he published little new poetry. His later work focused on lectures and appearances, essays, reviews, translations and the publication of his journals. His most critically acclaimed later works include Night Thoughts and The Sun at Midnight. He also had a long-standing relationship with Enitharmon Press, founded in 1967 by Alan Clodd, which resulted in numerous publications. Gascoyne’s intense poetic sensitivity (often characterized as visionary or mystical) was tempered by severe depression and he devoted many years to recovery. It was during a stay at a hospital on the Isle of Wight that he met Judy Tyler Lewis, whom he married in 1975. He had four stepchildren. A description of the collection can be found on line: David Gascoyne Collection. Related materials in the Beinecke Collections can be found by searching the Finding Aid Database; recently acquired materials may be found in the Uncataloged Acquisitions Database. David Gascoyne’s published work can be located by searching Orbis, the library catalog. Montgomery Hare, 1911-1998, was a playwright, theater producer, and poet. Born in New York City, Hare graduated from Groton School in 1929 and from Yale University in 1933 with honors in literature. Hare wrote and directed plays for the Barter Theatre in Abingdon, Virginia in the late 1940s, and was also active with the Parsons Theatre and the Penobscot Charitable Trust. His published books of poetry include Three Eagles (1954), To Beat the Air: Poems and Drawings (1964), and Say This of Me (1981). He also wrote novels and his memoirs. From 1940 on, Hare lived in Cornwall, Connecticut. He was a founder and president of the Housatonic Valley Association, which worked to protect the lands and waters of the Housatonic Watershed. Books by Montgomery Hare in the Yale Libraries can be located by searching Orbis, the library catalog. The Yale English Department and the Whitney Humanities Center invite scholars and students to attend “What is Close Reading? A Symposium on Cleanth Brooks and the New Criticism” on September 29, 2007, at the Whitney Humanities Center Lecture Hall, 53 Wall Street, New Haven. “What is Close Reading?” celebrates scholar, educator, and lecturer Cleanth Brooks. Among the most influential literary critics of the twentieth century, Brooks is credited with revolutionizing the study of poetry. Brooks was appointed professor of English at Yale University in 1947, where his courses on Faulkner became legendary. His major works include American Literature: The Makers and the Making (with Robert Penn Warren and R. W. B. Lewis) (1973), The Hidden God (1963), Literary Criticism (with William K. Wimsatt) (1957), Modern Poetry and the Tradition (1939), Understanding Fiction (with Warren) (1943), Understanding Poetry (with Warren) (1938), The Well Wrought Urn (1947), and four books on Faulkner. The Cleanth Brooks Papers at the Beinecke Library contain correspondence, manuscripts of books, textbooks, essays, lectures, and various other shorter works, classroom material, professional papers, writings of others, and personal papers which document aspects Brooks’ life and career. The material spans the years 1927 to 1986, with the bulk falling between 1960 and 1986. Related collections at the Beinecke Library include: the Robert Penn Warren Papers and the Robert Fitzgerald Papers. Additional related materials may be located by searching the Finding Aid Database and the Uncataloged Acquisitions Database; copies of Brooks’ books in the Yale Libraries can be located by searching Orbis, the library catalog. For more information contact Susan Shand and Manana Sikic.